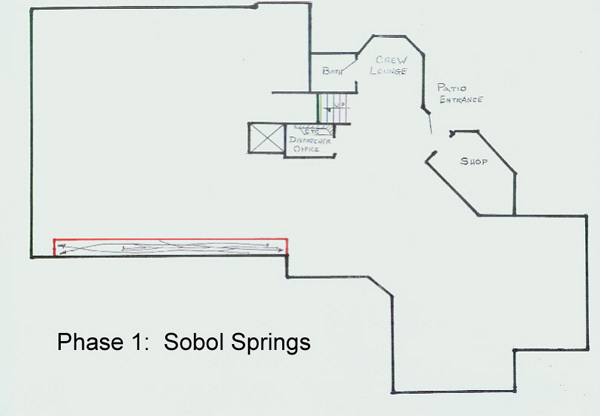 Construction began at Sobol Springs on January 19, 2008. About 25' of A&O mainline and the A&O subsidiary, the New River and Western comprise this first phase. An overview shows the A&O main along the wall with the NR&W providing the rest of the trackwork. Several industries will keep the NR&W Local crew busy once per session. To create a smooth flowing edge for future fascia, a wood spline was initially set atop the plywood/micore base and a pencil line drawn. A saber saw completed job. A future pile trestle will carry a siding over the creek and be the main focus of this scene. The "Springs" features the "Cookie-Cutter" style framing for the various track levels. The A&O and NR&W mains drop a consistent 2% the length of the scene with the diverging tracks returning to level. Hoppers sit at the site of the future Atomic Fuels operational coal loader. The box car is being held on the 2% grade by a retractable grade-brake. Also visible is the lengthening/relay of the Falls Church Branch off the NR&W as it exits into the aisle. Doing this will provide a place to hold cars when switching the Springs. The fascia has been added and the future site of Sobol Creek is easily seen. Ready for backdrop painting and scenery! To conserve aisle space, a pull-out drawer holds the Springs control panel. Horizontal car card pockets will be added with enough room left for some sorting space.